This post is a lacking in many areas, but being pressed for time this will have to do. Any errors are my own. When visiting the Land of Spare Time I will be sure to come back to this post and recheck some facts with other sources. Her name was Bismarck. Big, fast and with an experienced crew the Allies had every right to fear her. The year was 1940 and it was only the year before Bismarck had been launched. Now she was preparing to break through British patrols and out onto the Atlantic where she could wreck havoc on Allied shipping. Along with Prinz Eugen, Bismarck set sail on 19 May beginning Operation Rheinübung. The next day the world was made aware that Bismarck was on the move after the Swedish noted the German vessels’ passing. It didn’t take long for the information to spread to the British Admiralty. Great Britain was not going to sit back and twiddle its thumbs while waiting for Bismarck to find them. Instead they dispatched vessels to locate Bismarck. Air reconnaissance had turned up the ship’s position in Norway, but for how long she would remain there was unknown. The planes had not gone unnoticed by Bismarck. Despite poor weather conditions and ice encounters the Germans proceeded ahead. The Denmark Strait lay ahead and potential action with British ships (HMS Suffolk and HMS Norfolk were patrolling the area). Who would emerge the winner was a question that only time would answer. The Royal Navy vessels Hood and Prince of Wales had been dispatched to the Denmark Strait but it would be some time before they caught up to the Germans. On 23 May Suffolk sighted Bismarck and Prinz Eugen. Prinz Eugen was to attack Suffolk but Suffolk took advantage of the foggy conditions and disappeared into the mist. Meanwhile a message was sent off informing the Admiralty of the sighting. Suffolk shadowed Bismarck while maintaining a distance between herself and the Germans, not wishing to engage them. Norfolk, on the other hand, ventured too close and took a beating before disappearing into the fog. The next day Prince of Wales and Hood at long last arrived. Almost at once they engaged the German vessels; Hood firing on Prinz Eugen and Prince of Wales on Bismarck. Hood received the brunt of the fire enduring attacks from both of the enemy vessels. But it was Bismarck who delivered the devastating blow. A shell found its mark causing an explosion aboard Hood. A thick smoke enveloped the broken ship as her bow and stern both rose into the air before sinking out of sight. Of her more than 1,000 strong crew only three survived. With Hood’s loss Prince of Wales now had to fend for herself. It wasn’t much longer before she retreated behind a smoke screen. After the skirmish, damage aboard Bismarck was assessed. Admiral Gunther Lutjens, in charge of Operation Rheinübung, decided to proceed to St. Nazaire where repairs would be made. The British were still tailing her, a task made somewhat easier now that Bismarck was leaving a trail of oil in her wake. In the aftermath of Hood’s loss British ships were dispatched from all around to find Bismarck. On 25 May Bismarck was able to lose the British while out of range of their radar by slipping behind the vessels. Having lost her trail the British ships that had been tailing Bismarck spread out. When she was finally located by plane it showed that there was little hope that British forces would catch up to Bismarck before she reached the safety of her own. The last shreds of hope rested with aircraft carrier Ark Royal’s planes. 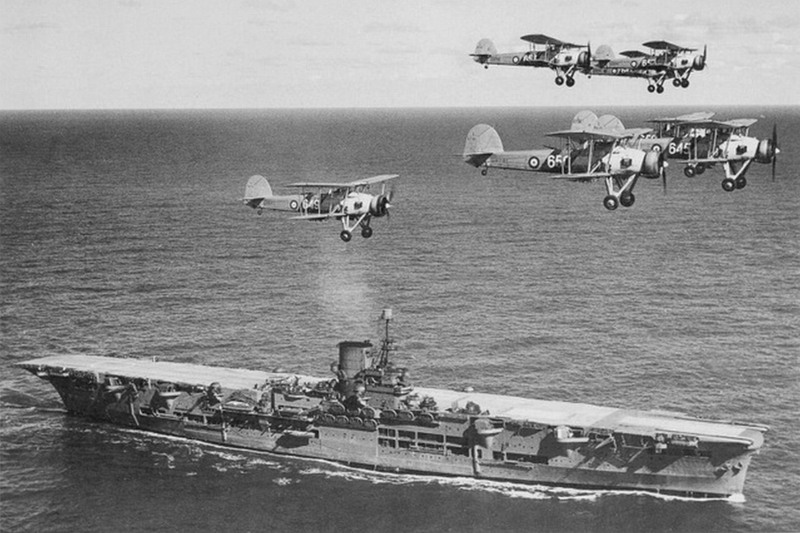 After they pinpointed Bismarck on 26 May Swordfish planes returned to Ark Royal where they were armed with torpedoes (with magnetic detonators). Once in the air, the Swordfish mistakenly attacked HMS Sheffield. Fortunately, the magnetic detonators caused the torpedoes to explode prematurely. Sheffield was not hurt and it was a lesson learned. The Swordfish returned to Ark Royal where they traded what was left of their “faulty” torpedoes for torpedoes with contact detonators. This time their attack was to, a degree, a success. Two torpedoes found their mark with one doing serious damage to Bismarck’s steering. Among other things the port rudder was jammed. For awhile Bismarck sailed in circles, unable to escape from the enclosing enemy. Theirs was a lost cause which many were realizing, but there would be no surrender. Lutjen vowed they would “fight to the last shell”. Controversy surrounds the events that followed next. HMS King George V and HMS Rodney closed in for the kill as they fired on the Bismarck. Shell after shell fell on Bismarck and yet there were no signs of German surrender. Fire had spread from one end to the other and the Bismarck was a complete mess. Yet she wouldn’t sink. With just enough fuel to get them home, the two ships withdrew while the HMS Dorsetshire moved in to torpedo the floating hulk. Aboard Bismarck orders were being given to abandon ship as scuttle efforts got underway. Bismarck eventually slipped beneath the waves never to rise again. but which method it was that actually sunk her is still up for debate. Of the over 2,000 in crew, 400 were left on the surface. 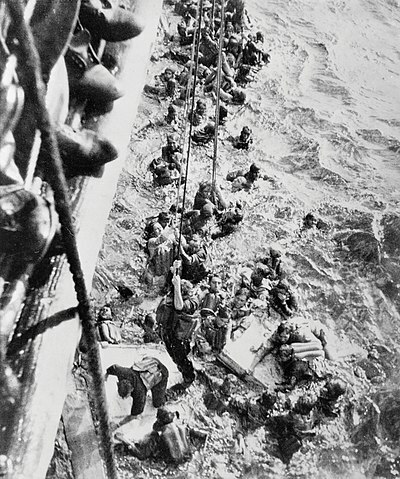 The British rescued 110 in all while the Germans later located 5 more survivors. Bismarck was gone and the intense search over. The wreck would remain hidden in the depths of the Atlantic until she was discovered in 1989 by Robert Ballard of RMS Titanic fame. You brought it to life in a way that was far from lacking! We all wish we had more time, It’s good that you don’t let that stop you from posting. I agree that you brought it to life and was a interesting story. Remember hearing in history about Sinking the Bismark. Oh no! I just noticed that there is a “British Version” of the “Battle of New Orleans”! I have heard Johnny Horton do that song and like it. The first one was about Sinking the Bismark. Thanks for this refresher course. There were only three survivors on HMS Hood. Oh how sad that the last survivor is now dead. Glad to hear you found it so. Love reading your posts, especially about naval history. Thanks J.G… absolutely fabulous!!! Whilst reading… Johnny Horton’s song kept ringing in my ears as I remembered my brothers and I singing it with great gusto during those teenage years of long ago…. Thanks again… great story, well told. Have you ever watched the movie “Sink the Bismarck!” (1960)? ha ha ha… I’m cracking up now J.G. Had a look a the “Battle of Bull Run” and don’t remember it at all. Certainly wasn’t a hit here in Australia, probably cos it’s uniquely re: the History of the USof A. However, whilst on YouTube, had a look for the most favourite Johnny Horton songs of my brothers and I… “The Battle of New Orleans”… and now see I was beaten to it by your post of the British version/ response. It’s probably a good thing you don’t remember it! “…and Philadelph-I-A…”. I don’t imagine it would been overly popular here as it certainly isn’t one of his more well-known songs. What a relief, eh? 😉 It would appear that Horton had a preoccupation with running the enemy into various bodies of water. First he runs the British to the Gulf of Mexico and then tries to run the Confederates into Galveston Bay! Your poor dad (made me giggle)! “The Battle of New Orleans”, “Sink the Bismarck” and “Johnny Reb” have always been favorites with us. The latter is a little sad. It remains a fascinating story… such sacrifice in the name of superiority on the high seas! Death on the ocean must be a little more scary! Brave men on both side gone for what? Nothing but stroking someone’s misguided ego? At least on land one had a fighting chance of coming out alive. If one had injuries which would have hindered one from getting off and away from a sinking ship the chances of living through such an event would have plummeted somewhat. So yes, I agree with you that death at sea must be something a good deal scarier for some folks. Thank you, Ensign. 😉 There’s plenty of these stories out there so no doubt more will be coming up in the future months. I’m flabbergasted by how many books are being released all the time concerning World War II shipwrecks. As a side note I am beginning to dig into the Vajont Landslide and a post will be forthcoming by this month or September – finally! Regarding Vajont, I am excited and very much looking forward to your post. I must apologize to you for not being much help so far – I will do my best to work on it this weekend and hopefully send you an email with a few links on Sunday. Have a wonderful weekend, JG! My interest is snagged! What a fascinating story. And since this is something that isn’t so well-known it’s perfect material to do some digging into. Many thanks for pointing me in the direction of this story. That would be great, thanks. Google’s newspaper archive as well as Fulton History have some articles on the disaster and at present I’m going through those. Yay, I am happy you liked the story! I also find it an interesting, definitely unusual one. And one that reminds us of values of the past (like saving the lives of the sailors) and of the respect that there used to be even between adversaries. On Vajont, I emailed you a few links that I think are the best I have come across in terms of reliability and accuracy. Hope they help. The respect you mention is always intriguing. In the midst of the bloodshed and horrors some individuals don’t allow it to influence good decisions. De la Penne’s actions were really impressive. I got the email and am perusing the links you sent. Very interesting and detailed stuff! Thank you, it is indeed a big help. A great post and enjoyed reading it. People not reading the comment section are missing a whole lot. This is what works for me – Upload a picture more than 1000 pix wide and insert it as the featured image in the post you wish to appear in the slider. Then set the post as sticky. If it doesn’t work try an even larger picture. By following these instructions the slider will automatically appear. And the instructions are for the Forever Theme only as I am not very familiar with other themes which allow and do not allow for a slider. When I have the time I will try to do a “visual” tutorial and create a F.A.Q. page here. Perhaps that will help. Many thanks, Ben, for your interest and kind words. I have plans for a future post soon and it will feature a far off exterior shot of the LST-325 (a vessel that was present at Normandy on D-Day); and there may be some other WWII odds and ends, as well. I’d have to go through the photos again. No problem! I was happy to stumble across your blog in the WP Reader and am following through Bloglovin’.